That's not the beginning of a bad joke, but rather the subject of a recent painting by artist Andy Thomas called "The Republican Club" that's hanging in the White House. "I'd been working, and I turned on the football game," the Missouri native said, adding that after his wife saw that social media had lit up, the phone calls began pouring in. The foreground of "The Republican Club" shows a noticeably thinner version of a smiling Trump seated between Eisenhower and Nixon. Across from Trump are Lincoln, Reagan and George W. Bush while Ford, Roosevelt, George H.W. Bush are standing around the table. The seated men have drinks — Trump's is nonalcoholic — and they are all smiling. "I imagine everything Lincoln said was funny, so I always want to have him being funny," he said. "There's some sort of give and take between Trump and Lincoln and everyone is in on the story." He added: "I'm going to make them all good looking and having a really, really good time. We don't really know how they would get along. Certainly they have different personalities." 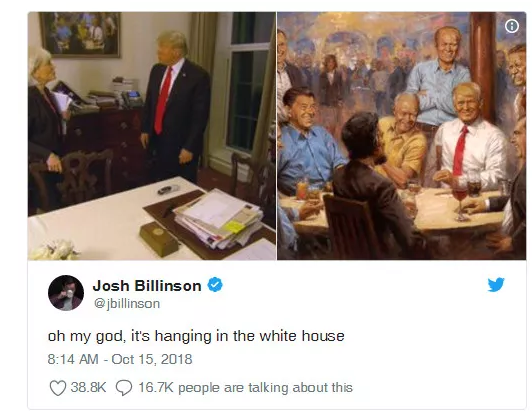 "It was a really gracious phone call and he had a kind voice," Thomas said, adding that while he knew the painting had been given to Trump, he had no idea until "60 Minutes" that he had actually hung it. "I was happily surprised it was hanging in the office there somewhere." He added, "I suddenly felt too good to go do work out in the backyard."